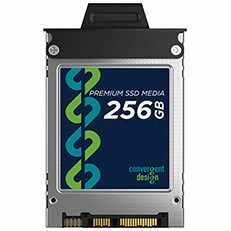 Convergent Design 2.5″ SSD’s are server-grade drives with built in power protection. All Convergent Design SSD’s are thoroughly evaluated and tested. Prior to distribution, all SSD’s are burned-in and checked for errors. From burst length to que depth, there is a bevy of technical considerations taken to ensure maximum performance. Active and idle power consumption effects heat, battery life and reliability. Convergent Design recorders are known for being small, light, low power recorders, so you can expect the best performance from our SSD’s. Convergent Design SSD’s will recover and close clips in the event of lost power. Off-the-shelf media can have very slow closing files and formatting, effecting time between takes. When you hit record, you can be sure that our SSD’s will be alert and ready to capture!